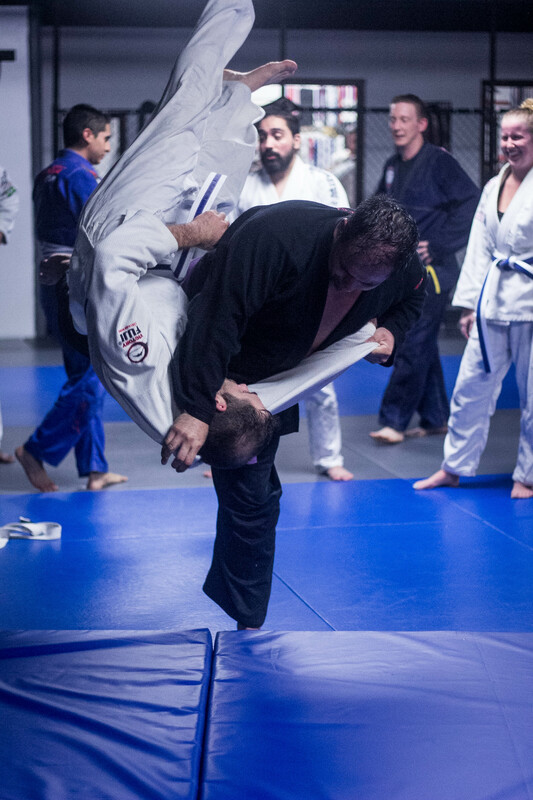 Judo is taught by Judo and Brazilian Jiu-Jitsu Black-belts in Downtown, Midtown and Surrounding Areas in Houston. Judo, meaning "gentle way" was created in 1882 by Jigoro Kano in Japan. The objective in Judo is to either throw or take-down an opponent to the ground. A judo practitioner is called a judoka. The following are fundamental techniques to practice in order to prevent the possibility of becoming injured during a takedown attempt. Forward Rolls and Backward Rolls – Brazilian Jiujitsu practitioners should already have knowledge on how to perform forward and backward rolls. New students are taught how to properly and safely roll over the shoulder instead of their head and neck which may cause harm to that area. Injury Prevention – Always keeping your head down and chin tucked to your chest as you are being thrown protects your head and neck from injury. This also prevents your head from bouncing off the ground or mat. Sideways Breakfall – Learning to fall on your sides and slap the mat with the same side arm is another crucial technique in martial arts. Backwards Breakfall – When getting thrown back or falling back, slap the ground with both of your hands out close to your waist. Keep your chin tucked! See Injury Prevention.